Vegetables are sure the key to good health. However, if cooked in wrong way, they can lose all their nutrients. The cooking techniques that minimize cooking time, temperature and water keep the nutrition intact in the cooked food. Here are some facts and tips on right way of cooking vegetables so as to preserve their nutritional value. Remember that water which is used for cooking will wash away the vitamins and the heat will deteriorate them. So, try to keep the cooking time as short as possible because longer time means more damage to the food. Steaming is the healthiest way of cooking vegetables. It is fast and preserves the nutrients of both fresh and frozen vegetables. Pressure cooking, with the whistle on, is also healthy as it takes lesser time to cook and also can be done with little water. Next comes stir frying and panning on medium heat. The Indian way of cooking is panning where the vegetables are sauted in oil and spice while covering the pan. It only deteriorates when excessive oil is added to the preparation and it is cooked on low temperature for a very long time. Stir frying the vegetables on medium/high heat for 5-10 minutes is better option. Microwaving is considered a good technique for keeping the nutrients intact in food. However, some recent studies state that a large amount of flavonoids is lost when food is microwaved. Cooking food as close as possible to serving time is a good practice. Selecting the right type of vegetable is also important. They should be tender and crisp. 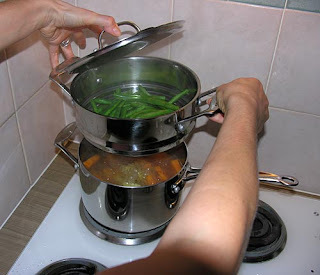 Pots should always be covered so that nutrients can not escape along with the steam. The order of best cooking techniques that preserve most of the nutrients in vegetables can be stated as steaming, pressure cooking, stir frying, grilling, sauteing, poaching, braising, roasting, baking and boiling.